The first phase of Preconsultation in the Fair For Life revision process is over. You can consult the results here. The information gathered in the Preconsultation will now be used to work out a first draft of the revised standard. Remember that in November 2016 the draft scheme will be available to identified stakeholders and the public, without restriction. The Fair for Life Scheme is regularly updated and revised to account for new developments in the social and fair trade sector and to ensure continuous improvement of the scheme. IMO´s Fair for Life Fair Trade and Social Responsibility Programme today finalised the Global Social Compliance Programme (GSCP) Equivalence Process as the first product certification scheme that applies to a wide range of products, ensures fair production conditions down to farm level and is guaranteed by an independent ISO 17065 accredited certification body. By means of the GSCP Equivalence Process Fair for Life has been benchmarked against international best practice of existing sustainability systems and standards as set out in the GSCP Reference Tools. The results of the benchmarking process are now available for sharing and comparing on the GSCP Equivalence Process’ online platform (by registered platform users only). 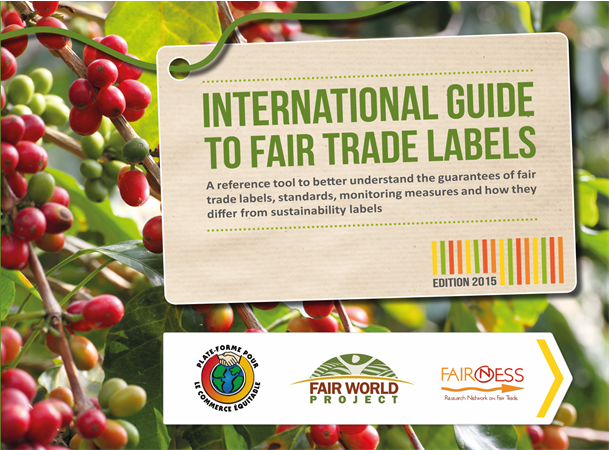 The International Guide to Fair Trade Labels is now available! "Why are labels and guarantee systems necessary to guarantee fair trade practices? Which are the main fair trade criteria controlled by the labels and are the certification processes relevant ? What are the main differences existing between fair trade labels and sustainable development labels?" In order to meet all these issues, this guide examines 8 labels and guarantee systems claiming to be fair trade labels - Ecocert Fair Trade, Fair for Life, Fairtrade International, Fair Trade USA, Forest Garden Products, Naturland Fair, Small Producers’ Symbol and World Fair Trade Organization - and offers a comparison with 5 sustainable development initiatives which are sometimes confused with fair trade labels - 4C Association, Bonsucro, ProTerra Foundation, Rainforest Alliance and UTZ Certified. This publication is the result of an international collaboration between four stakeholders involved in the fair trade sector: the French Fair Trade Platform (PFCE), Fair World Project, FairNESS France and FairNESS United Kingdom. We would like to invite all interested parties to participate at our webinars introducting the Fair for Life Social & Fair Trade Certification Programme. Click here to see the dates and registration details. Fair for Life certified product sales increased 44% Q1 of 2014! New SPINS data shows that Fair for Life Fair Trade certified product sales growing at an astounding rate. Overall fair trade certified product sales are reported to be up 16% in Q1 versus comparable year ago, and FFL is helping to drive that growth with a 44% increase in sales specifically of Fair for Life Fair Trade products alone. Product sales growth for the year (52 weeks ending Q1 2014) is also high, with 33% growth reported. Not only are the Fair for Life Fair Trade certified products mostly consisting of strong brands in the natural market channel, they also tend to come from companies that are “mission-driven”. Click here for the press release. If you would like to get an introduction to Fair for Life please join one of our webinars. To find out more about the dates and where to register follow this link. The Swiss Organisation Pusch (Praktischer Umweltschutz Schweiz - Practical Environmental Protection Switzerland) has updated its internet platform labelinfo.ch. Interested German speaking consumers can check the credibility of 145 labels and thus get support in their decisions regarding ethical consumerism. Fair for Life is one of the few labels which got full marks. The three categories checked were transparency control and certification. You can have a look at the entry on Fair for Life by clicking here. The webinar on an Introduction to the Fair for Life Social & Fair Trade Certification Programme which was set for Wednesday 19th March has been rescheduled for Friday 21st March! Please click here to join. If you couldn´t attend one of our last webinars you can sign up for one of the three forthcoming for an introduction to the Fair for Life Social & Fair Trade Certification Programme. To find out more about the dates and where to register follow thislink. Remember to sign up for our webinar! If you are interested in learning more about the Fair for Life Social & Fair Trade Certification Programme we would be happy to welcome you to our webinar on 11th February 2014. To find out more about how you can register please klick here. Minor revision of Fair for Life Programme completed! We are happy to announce, that the minor revision of the Fair for Life Programme has been completed. As from May 2014 the new versions of Module 1 Labelling and Control and Module 4 Handling Operations will be applicable for operations wishing certification. The Fair for Life Programme has also been adapted according to new principles. To have a look at the updated Programme and Modules please visit the revision page of our website. We would like to thank everybody who took part during the revision process and helped to further improve the Fair for Life Programme. On 15th January and 11th February 2014 we will be offering webinars introducing the Fair for Life Social & Fair Trade Certification Programme. Space is limited, so reserve your seat now! To find out more about how you can register click here. 2013 has again been a very successful year for Fair for Life. There are now 200 operations certified For Life or Fair for Life. Our website has a brand new design and a list of all certified products on one single page. Furthermore, the Programme and Modules 1 and 4 have undergone a minor revision, the results of which will be published shortly. Moreover, we are very excited by the growing worldwide acceptance of our brands Fair for Life and For Life, e.g. by Alko Finland, the government-owned national alcoholic beverage retailing enterprise in Finland. We would like to thank everybody for the support you have given Fair for Life and the fair trade movement. We wish you all a very good start in the new year. Please notice that the Fair for Life team will be out of office in the time from 23rd December 2013 until 6th January 2014. Fair for Life news n° 8 out now! The new edition of the the Fair for Life news has been published. If you wish to subscripe to this newsletter just send an e-mail to info@fairforlife.net or use the online contact form. There are more than 500 "for Life" and "Fair for Life" certified products, from A as “almonds” to Z as “za´tar”. Explore the fascinating world of fair trade products with the new list of certified products on the Fair for Life website. Browse the list to find out which products or product groups are certified and who produces them. Click on the name of the company to find out more about its achievements. Get to the list here. For the third time, the annual Natural Cosmetics Conference will take place at the Hotel Ellington in Berlin on 24th and 25th September 2013. Once again the Conference will offer an international platform for intensive networking and the discussion of current trade topics. The Conference will foremost focus on the topics of sustainability and value-oriented management. Fair for Life is acting as conference partner. Make sure you meet with us! For more details on the conference please klick here. An exciting job opportunity has arisen. The certification body for Fair for Life, IMO, is looking for a Fair Trade Senior Representative in the USA. If you are interested please download the job specification and further details on how to apply here. All interested parties are invited to send their comments on the first draft version of the Fair for Life Programme modules up for minor revision. We are looking forward to receiving your comments by midnight the 26th August 2013, Central European Time. Please send your comments to revision@fairforlife.org. Fair for Life news n° 7 out now! Alko Finland, the government-owned national alcoholic beverage retailing enterprise in Finland, has expanded ist selection of etchical trade products by accepting For Life certified products in the group. Environmental and ethical issues are important to Alko Finland, and it wishes to increase the number of such products that support sustainable development. Suppliers can offer For Life products starting from July 2013 searches. In consumer communication this will show from the beginning of 2014. For more information please klick here. Submissions for the 5th Annual Fair Trade Calender Photo Contest have been finalised. Voting is now open to determine the 12 pictures which will be used for the Fair Trade Calender 2014. Vote for your favourite photos until the 9th July! You can vote for up to five photos. To take part visit the FTRN website. The Fair Trade Resource Network (FTRN) is conducting its fifth calender photo contest. Entries can be submitted during 7th-26th June 2013. You can vote online for your favourites from the 27th June until the 9th July. The 12 winning photos will be featured each month in the 2014 Fair Trade Calendar. To find out more about the contest and submit a photo visit the FTRN website or send an e-mail to photocontest@ftrn.org. Join the World Fair Trade Day! Fair Trade Resource Network is delighted to announce plans and resources for World Fair Trade Day in N. America, with events taking place 4th-9th May 2013. IMO, the certification body offering Fair for Life certification, is one of the event´s sponsors. Download the free World Fair Trade Day Activities Guide for tips, ideas, and resources! You can also order free WFTD promotional stickers and postcards, free Fair Trade products (sugar, spices, nut butters), 25 free kids books, a T-shirt, and lots of educational resources. More at www.ftrn.org/wftd. You are invited to host WFTD events during 4th-9th May - including Fair Trade festivals, fashion shows, speeches, food and drink tastings, film showings, sports games, neighbourhood crawls, spa nights and concerts and much more – to promote fair trade and campaign for trade justice together with farmers and artisans around the world. Modules 1 and 4 of the Fair for Life Certification Programme will undergo a minor revision. In further reaction to the allegations by the ILRF, Fair for Life and IMO have prepared a detailed statement which includes a summary of actions taken by IMO in reaction to the allegations, audit findings and IMO's evaluation, together with responses to the other points raised in the report. Please click here to read the statement. On Monday, 11th February 2013 the International Labor Rights Forum (ILRF) released a report on alleged labour right violations by a US chocolate company and IMO, the Fair For Life certification body of the company. While IMO appreciates the ILRF´s concern for workers rights, it does not accept the report findings and conclusions. Fair for Life is the only certification programme worldwide that requires fair working conditions along the entire chain of custody and IMO strongly believes that the present campaign damages workers interests in the US as it discourages companies from public commitment to fair working conditions. With respect to the main complaints raised about the Fair for Life Programme, IMO has published a response. Please click here to read IMO´s response. The Bio-Foundation will be conducting a minor revision of the Fair for Life Programme in 2013. The scope of this revision will be Module 1 (Labelling and Control Requirements) and Module 4 (Handling Operations) only, as implementation of the programme in by now over 180 operations worldwide has indicated several technical aspects that need to be further clarified or strengthened for effective implementation of the programme and its objectives. The standard revision procedures as well as overview of the 2013 revision process (rational, scope and timeline) will be published soon. Fair for Life will be present on the Biofach in Germany. You can visit the team at the booth of the certification body Institute for Marketecology (IMO) No 1-101 in Hall 1. You are welcome to make an appointment at info@fairforlife.net. Get to know the Fair for Life network! Visit our BioFach event “Establishing Fair for Life Supply Chains”, on Friday 15th February 2013, 10:30-12:00 CET, Room Munich to find out more about Fair for Life and certified operations. The Fair for Life team is proud to look back on a very successful year. In 2012, about 45 new clients wished to become Fair for Life or For Life certified, which is an increase of about 40%. Most new clients come from Africa, South- and Latin-America and North-America including Canada. At the end of the year there will be about 170 companies certified. Exciting new products certified in 2012 include biodegradable bags and pacific shrimps. Many interesting developments happened in 2012: Fair for Life has been accepted by IDH into their sustainability programme, as one of 5 large certification systems. Additionally, Fair Trade Towns recognised Fair for Life as an approved certification scheme. In September, Fair for Life has been included in the ITC Standards Map. We would like to thank all Fair for Life certified operations and supporters for the successful year and are looking forward to an at least equally successful 2013. We wish everybody a very good start in the new year. Please notice that the Fair for Life team will be out of office in the time from the 22nd December 2012 until the 6th January 2013. Webinars "Introducing Fair for Life"
You are invited to participate in one of the upcoming webinars to find out more about the Fair for Life Social & Fair Trade Certification Programme. Tuesday, December 18th, 2012 9:00 - 10:00 am PST Click to register. Tuesday, January 15th, 2013 9:00 - 10:00 am PST Click to register. Tuesday, February 12th, 2013 9:00 - 10:00 am PST Click to register. Wednesday, March 13th, 2013 9:00 - 10:00 am PST Click to register. Fair for Life news n°6 out now! The International Trade Centre (ITC), a joint organisation of the United Nations and World Trade Organisation based in Geneva, Switzerland, has one goal: to help businesses become more competitive in global markets, speeding economic development and contributing to sustainable development. As part of this goal, ITC has developed a new web platform called Standards Map that provides comprehensive and comparable information on sustainability standards and audit protocols, with the aim to strengthen the capacity of producers, exporters and buyers to participate in more sustainable production and trade. The Standards Map platform offers an online "comparison tool" that enables users to make analyses, comparisons and reviews of sustainability standards and audit protocols using a unique set of criteria, audit best practices and good governance models. ITC collaborates with over 75 organisations that have developed standards systems, codes and reporting systems. The information on Fair for Life is now made available on the Standards Map platform on www.standardsmap.org. It enables users to perform customised analyses, save their settings online and share work with their social media networks, such as Facebook, Twitter and LinkedIn. A free trial access to the Standards Map online comparison tool is offered to all new users who register from the Standards Map homepage. Fair Trade Towns USA (FT Towns USA) has officially announced the acceptance of Fair for Life Fair Trade Certification under the FT Towns USA criteria. FT Towns USA is a movement made up of a diverse group of inspired activists, engaged community groups and organisations, and socially responsible members of the business community. It is committed to raising awareness within communities so that every dollar spent can be a powerful decision, with ramifications across continents, countries and communities. There are 28 Fair Trade Towns across the USA, and many more with campaigns in progress. After much research and careful consideration, the National Steering Committee of Fair Trade Towns USA has concluded that the Fair for Life programme meets many rigorous standards that are crucial to fair trade. From delivering impact to producers and farmers to evaluating the business practices of the companies using its label, Fair Trade Towns USA has announced that Fair for Life indicates that strict criteria have been met to empower producers and protect the environment. Through their recognition of Fair for Life, a broader grassroots movement will help to educate consumers about the label and garnish more commitment from retailers and community organisations to carry Fair for Life fair trade certified products. To learn more about Fair Trade Towns USA, please click here. Fair for Life has further increased its scope of fair trade certified products. It is exciting to observe that more and more ethical companies with products that have so far not been considered as classical fair trade merchandise are increasingly taking steps to enter the fair trade market and contribute to widening the impact of Fair for Life certification. In June 2012 biodegradable, Fair for Life certified bags made of tapioca starch have become available. An Indonesian company purchases tapioca starch from hundreds of rural households in Indonesia which are organised into a farmers group. Plastic bags are individually designed by the customer and then printed at the factory. In August 2012 another interesting product joined the fair trade movement. Pacific white shrimps (Litopenaeus vannamei) have been certified Fair for Life Fair Trade, becoming not only the first Fair for Life shrimp certification world-wide but also the first time an animal aquaculture product could be certified Fair for Life. In general, working conditions in production and processing are often precarious in the aquaculture industry world-wide, with low wages paid and with inappropriate working conditions. This is one of the reasons why so far no other fish or shrimp aquaculture operator achieved Fair for Life certification. The Ecuadorian company has been a pioneer in taking up the challenge to convert its production and convince its partners in the trade chain to do likewise. Please find here the press release. The German "Forum Fairer Handel" has commissioned an extensive comparison study of several new fair trade systems (Fair for Life, Ecocert Fair Trade, Naturland Fair and Small Producer Symbol/Tu Simbolo) which will be published this month in German, English translation of the report will follow. The Forum Fairer Handel concludes that Fair for Life as well as Ecocert Fair Trade and Naturland Fair are indeed true fair trade certification systems. Content wise the standards reach FLO level or even exceed it. There are differences between all standards, but -mostly only of a gradual nature. For more information please klick here. Fair for Life news n° 5 out now! With the goal to highlight the best activities in Fair Trade across all recognition systems, the Fair Trade Resource Network announces the “Best in Fair Trade Award”. They are now accepting public nominations of business and nonprofits, through March 31st. Please feel encouraged to get more information and Award details on the FTRN website. As the world of fair trade can be complicated to understand and distinguish the various organisations, labels and major names involved, IMO has found it important to help promote education of fair trade. One fair trade advocacy organisation that is doing a great job in their educational efforts is the Fair Trade Resource Network (FTRN). FTRN creates a wide spectrum of resources and activities centred around fair trade. FTRN not only produces books, and other tools, such as stickers, t-shirts, a fair trade calendar, and event schedule, they also have an ongoing series of webinars on key topics relevant to the evolving fair trade movement. IMO has continued its support of FTRN this year through sponsorship of World Fair Trade Day, as well as sponsorship of the 2012 Fair Trade calendar, and an educational booklet on fair trade called The Overview of Fair Trade in North America. The Overview of Fair Trade in North America is a booklet intended to be a concise overview of the North American Fair Trade movement. It includes details of the various models of fair trade, along with success stories, major names, facts and figures, brief history and key challenges and opportunities. It is intended to help consumers navigate the complicated world of organisations, labels and definitions of fair trade, interact with the global community of fair trade, and understand how fair trade relationships in over 60 developing countries help to enhance the quality of life for producers and their communities. One of the major changes that have been made to the Fair for Life Programme regards the rating system. In order to adapt the new rating system to the Fair for Life website maintenance operations will be carried out until the 22nd July 2011. During this time it will not be possible to publish any new information on certified operations. We apologise for this and thank you for your understanding. Please check the website again after the maintenance time frame! Revised Fair for Life Programme! The revised Fair for Life Programme will be presented on the Biofach fair, held between 16th and 19th February 2011 in Nuremberg, Germany. In respect of the principles of the ISEAL Code of Good Practice for Setting Social and Environmental Standards (P005, Version 5.01 - April 2010) comments were invited and considered from a wide range of stakeholders through public consultation in two consultation rounds. The certification programme consists of the general programme with scope, objectives, background and all core principles and criteria; in addition, separate detailed control modules are part of the Fair for Life programme, which contain guidance texts on all criteria as well as the control points that will be verified during audits. Find out more about the revised Fair for Life Programme here. New Fair for Life Logo! Taking into concideration the feedback of stakeholders and conumers of the past two years a new Fair for Life has been developed. The new Fair for Life Logo will be introduced with the new Fair for Life Programme. Applicable versions, labelling guidelines and transition period will be communicated. On the 28th September 2010 the German Federal Ministry for Economic Cooperation and Development (BMZ – Bundesministerium für wirtschaftliche Zusammenarbeit und Entwicklung) has presented the online information platform Sustainability Compass. The platform has been created to support social, fair and environmentally friendly procurement and addresses public procurement officers as well as small and medium sized operations. Furthermore, the enhanced use of sustainability standards is focused. The Fair for Life – Social & FairTrade Certification Programme has been included within this database. Products labelled as Fair for Life meet both social/ fair as well as environmental criteria and the certification programme covers in addition to food products also non-food commodities. Find out more about the Sustainability Compass here. From 28th May to 27th July 2010 you are invited to contribute your suggestions for improvement, discuss key issues and propose changes to the Fair for Life Programme. We very much welcome and appreciate your comments and suggestions to improve the programme! The Fair for Life Programme was launched in late 2006 under the name "IMO Social and Fair Trade Programme" and was updated in 2007/2008. The current version (Version February 2008) has been the basis for all certification issued according to the "for Life" and "Fair for Life" Standards, including the respective checklist for auditing, verification of compliance and certification. Like all other standards, the Fair for Life Programme must be updated and revised at regular intervals to account for all new developments and requirements in the field of social responsibility, fair and ethical trading and environmental sustainability and sensitivity of production, processing and trade. Join the Fair Trade Party and invite the First Lady to make the White House a "Fair Trade Home!" Fair Trade the White House is a coalition of fair trade vendors and organizations, including IMO (The Institute for Marketecology). We are inviting the First Lady to join the fair trade movement and make the White House a "Fair Trade Home." The purpose of the outreach is to raise greater awareness of fair trade to the American consumer so each person will choose to "Join the Fair Trade Party," and integrate more fair trade purchases into their regular buying habits so that poverty is reduced in America and around the world. The Institute for Marketecology (IMO), one of the first and most renowned eco-certifiers, has been selected as a certifier for The Whole Trade Guarantee program at Whole Foods Market. The Whole Trade Guarantee ensures that products meet Whole Foods Market’s high quality standards, producers receive better wages and working conditions, and care is given to the environment during production. The Whole Trade Guarantee program aims to help end poverty in developing countries through the payment of honest, respectable prices for products bound for Whole Foods Markets.